We have been working for weeks on the new light show this year that is 10 times bigger than previous years. We are going to launch it 11/24/2017 at around 6:30 pm EST baring any technical issues. We are sure you will be dazzled by our new show with MANY MANY more lights. We look forward to seeing you all this year. 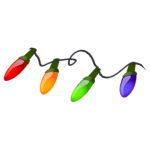 To put into perspective, we have over 20,000 lights, over 175 extension cords, and 10 controllers active for this year’s show.